Normal concrete structure contains greater compressive strength and very weak tension strength. For the purpose of removing the weakness of concrete in tension, pre-tensioning method is applied. 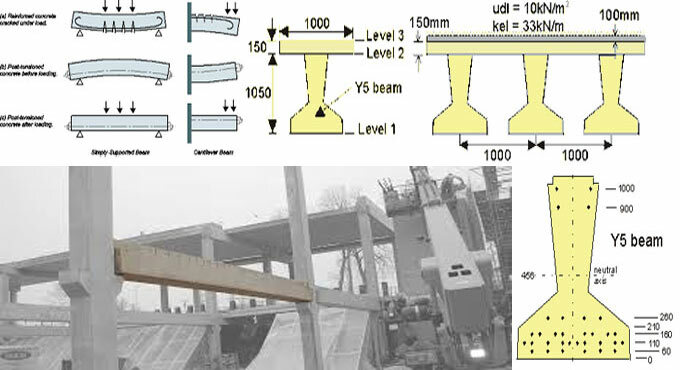 Pre-stressed concrete belongs to the autonomous formation of permanent compressive stresses in a structure to enhance its behavior and strength toward different service situations. Pre stressed concrete structure is categorized on the basis of their features of design and construction. The are categorized into the following three groups. Here, the pre-stressed structure may come as precast cast, cast in situ, composite constrictions. Precast pre-stressed components are fabricated in a plant or adjacent to the working site. Then they are conveyed to construction site and then they are constructed and set to its position. The cast-in-situ concrete is standard concrete that is poured into the exact formwork on the site and cured to attain the strength of RCC elements. So, the transportation and erection process are not necessary in this method. Composite construction is done by integrating both prestressed and cast in situ methods. As for instance, in a beam in a building structure is built up by pre-stressed concrete and the top roof slab is built up by the cast in situ method. Level of pre-stressing is categorized as completely pre-stressed, limited pre-stressed, partially pre-stressed. In fully pre-stressed concrete members, there is not any tensile stress under the operation of working or service loads. Members are pre-stressed to a limited extent in order that members may create some tensile stress under working loads but the magnitude is below the tensile strength of concrete. These members function as a completely pre-stressed member and remain uncracked under working loads. Partially pre-stressed structure contains both pre-stressing steel and reinforcing steel to withstand working load. Partial pre-stressing is useful for both pre-stressed concrete and reinforced concrete. The tensile stress remains within the limit.